This week I'm still reading Celebrity Shopper by Carmen Reid following a week commuting with friends so chatting was on the agenda more often than reading! 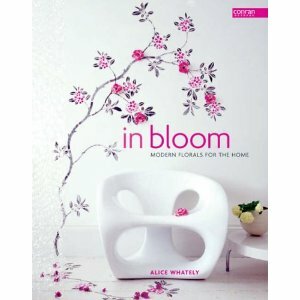 As you can imagine this book is filled with pages of floral inspiration for the home and I could happily step right into the pages! That looks like a book you can just dip in and out of. I'm sure you'll pick up lots of inspiration from it. I don't know 'Bloom', but I did a mural with flowers in our house last year. Mmmm I still didn't put it on my blog! Have a great time reading those books!! Your dinner looked so good!! Hey Momma share some of the photos that book looks so amazing!